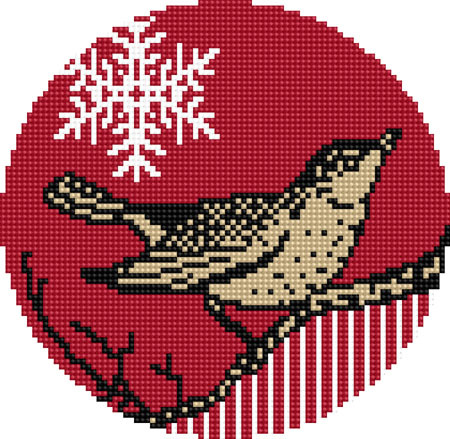 Miss Thrifty reader Felicity Hall, a needlepoint queen and purveyor of hot-to-trot needlepoint kits, got in touch to let me know that she has started to upload a wealth of free patterns to her new website. You can copy and print the patterns – and if you have any problems, Felicity will e-mail you copies as PDFs, which seems jolly nice. The first pattern is a Christmas ornament (pictured), with other patterns to follow. I’d love to have the time to do something like this. Right now it is very busy at work and I can barely find time to iron a pillowcase, let alone stitch a pretty project like this in an idyllic, domestic heaven-themed daze. In the meantime I can dream on, I guess!